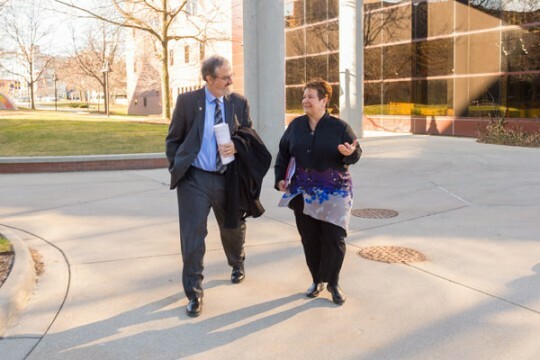 U-M President Mark Schlissel talking with UM-Flint Chancellor Susan E. Borrego on the Flint campus Monday, March 21, 2016. 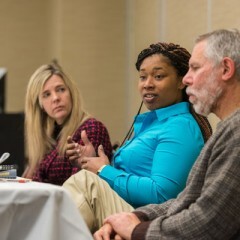 Those are just three of the many questions researchers from all three University of Michigan campuses hope to answer as they work with Flint community partners on projects that have received initial seed funding from U-M President Mark Schlissel. The president was in Flint today to meet with students, faculty and community partners on their work related to the water situation. “I was gratified to see the wide-ranging scope of proposals we received from our talented faculty members across all three of our campuses. It is a true testament to how deeply committed the university community is to Flint’s recovery from this crisis,” Schlissel says. UM-Flint Chancellor Susan Borrego and UM-Flint Provost Douglas Knerr hosted more than 140 faculty members from the Flint, Ann Arbor and Dearborn campuses Jan. 29 to discuss ideas for collaborations and opportunities to work with community organizations responding to the Flint water crisis. The president committed then to providing seed funding to help get the work started quickly. The funding for these projects totals $131,500 and was provided through donor gifts. 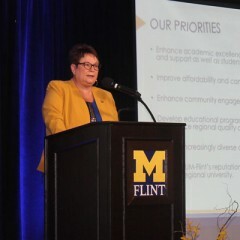 “We look forward to joining with our colleagues from throughout the state to continue our work to provide solutions for our community,” UM-Flint Chancellor Susan E. Borrego said. For the project focused on the long-term impact of drinking lead-contaminated water, researchers plan to take an inter-generational approach to assessing exposure of all those affected by the water crisis – from infants through older adults. The team includes experts from the U-M School of Public Health and UM-Flint’s School of Health Professions and Studies. The research focuses on assessing the medical, psycho-social, developmental and economic impact on those affected by following a group of people over an indefinite period of time. Community collaboration is a key component of a pilot project focused on how Flint youth perceive the water crisis and its impact on their lives. About 100 teens, age 13-17, will participate in a project designed to better understand their perceptions and needs for the future. Researchers from the U-M School of Public Health will team up with the Flint Odyssey House-Health Awareness Center, which also works with the Fathers and Sons Project Steering Committee, for the study. A third project will analyze existing data to examine the epidemiological effects of lead exposure on vulnerable adults in the Flint community by focusing on those who receive home care services. The project team includes staff from UM-Flint, UM-Ann Arbor and the Valley Area Agency on Aging, which serves the Flint community. “These projects represent a great depth of dedication from our faculty across the state to helping Flint, to offering their expertise and to being of service to address the multitude of issues surrounding the water crisis,” Knerr says. “Each of the research projects deals with important topics and they will all have different benefits that will lead to better ways to address the issues that have risen from the Flint water situation,” Pollack says. UM-Flint has been a leader in the efforts to help the community recover from the water crisis. The university responded proactively as a campus, starting water quality tests in fall 2014 and installing filters across campus immediately thereafter. UM-Flint also launched a new interactive map containing recent water test results—which continue to show the University of Michigan-Flint’s water is safe. Empowering Flint Youth Through Digital Storytelling: A Case Study. The project is a collaboration among teachers at UM-Flint, UM-Dearborn, UM-Ann Arbor and the Genesee Early College at the Genesee Intermediate School District. The project will focus on teaching journalism and digital storytelling techniques to Flint students as part of a summer class on environmental issues. Using written words, audio recordings and visual images, the teachers will assist the students in producing digital stories describing their own and others’ experiences in Flint during the past months. 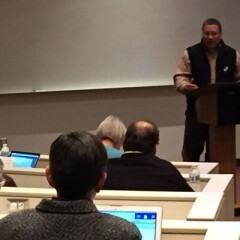 This proposal comes from a team of water-quality experts from UM-Flint, UM-Ann Arbor and Wayne State University. The team will assess the performance of the existing system, develop a comprehensive water safety plan and develop and implement a strategy for long-term engagement about water quality. The Flint Water Crisis and the Youth of Flint: What about our future? The proposal is a joint effort by a professor in the School of Public Health at UM-Ann Arbor and the Flint Odyssey House-Health Awareness Center. The researchers will conduct community forums with Flint youth to determine their perspectives regarding the water crisis, including implications for their future and what they believe should be done to secure their future moving forward. The researchers hope to submit a larger proposal to the National Institutes of Health, Centers for Disease Control and Prevention or relevant foundations in order to implement feasible ideas identified by the youth. Effects of the Flint Water Crisis on Vulnerable Adults. A team of gerontology researchers will study the health effects of lead exposure on other vulnerable populations, such as frail older persons or younger persons with disabilities. The project will use already available, longitudinal, standardized assessment data to examine the epidemiological effects of lead exposure on persons receiving home care services in the Flint area. The Valley Area Agency on Aging from Flint is working with the researchers. Planning for the Development of a Longitudinal Study of the Impact of the Water Crisis on the Flint Community. A team of epidemiology experts from UM-Flint and UM-Ann Arbor will take an inter-generational and life-course approach in assessing exposure of all those affected, including children, adolescents, younger and older adults. The group is interested in assessing the medical, psycho-social, developmental, economic impact on those affected across the life span. This will be a longitudinal cohort study following the exposed population over an indefinite period of time, with future funding mechanisms already in the works. Flint Water Situation: Knowledge and Perceived Risks in Two University Samples. Two health psychology faculty members at the UM-Flint and UM-Dearborn will assess the perceived risk of a sample of university students and employees in light of their comprehension of the nature of the risk. Additionally, the study will describe the sources of information the sample subjects find most credible. The study will present a description of a sample’s understanding of the water situation within Flint, as well as the attitudes toward perceived risks. The Effects of the Flint Water Crisis on Population Dynamics: Will Residents Flee Flint? UM-Flint professors in the department of Earth and Resource Science will investigate the effects of the Flint water crisis on population dynamics in the city of Flint. The city’s 2013 master plan anticipated that 20,000 people would leave the city by the end of the decade. However, because the master plan was written prior to the water crisis, the researchers believe population loss will accelerate. The researchers will also try to determine whether the people who are considering leaving vary geographically, demographically, or socioeconomically from other city residents.